This G816 is a light laptop bag that come complete with magnetic closing on flap. 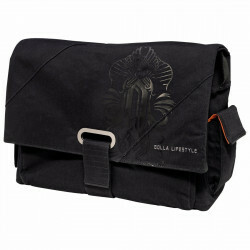 The padded body keeps the shape of the bag even without a laptop in it. Golla provide a funky range of laptop bags and laptop sleeves that will keep your laptop safely ensconced and looking good at the same time! Their designs are bright and youthful – perfect for laptops on the go meaning you don’t have to look like a square! There are two zipped pockets for putting your accessories anlong with two side pockets with magnetic closing. The large aditional front pocket offers enough room for note pads and other larger items. The bag has an adjustable shoulder strap with padding constructed of non-slip material making carrying your laptop, that little bit easier and hassle free. The main comprtment is EVA-cushioned meaning your laptop will always be safe. Q. Does this bag come with a warranty? Q. If I order this bag now, when will it be dispatched? Q. Can I return the bag if my laptop does not fit? A. We ask that you double check both your laptop dimensions and the bag that you are thinking of purchasing. If the bag arrives and the laptop still does not fit, we ask that you keep the bag with all of its tags still attached and return it to us at the earliest opportunity. Q. How do I know if my laptop will fit in this bag? A. If you have your laptop manual, it should list its dimensions. We list the internal dimensions of the bags. This should be enough information to work out if your laptop will fit.